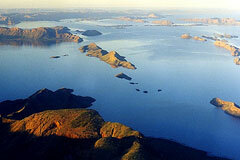 Lake Argyle is a majestic man made waterway, several times larger than Sydney Harbour. In fact, it is Australia’s second largest (Lake Gordon/Lake Pedder, Tasmania is the largest) artificial lake by area. The damming of the Ord River was completed in 1972 however this is not just another dam. The tips of the mountains of the surrounding Carr Boyd Ranges tumble into the lake making it look like some kind of strange desert fjord. Away towards the horizon small mountains rise out of the lake like islands. There are over 70 islands throughout the lake. Explore the lake by air to really appreciate its grandeur, or by boat for a glimpse of the diverse wildlife, which includes wallabies and hundreds of species of birds. Lake Argyle has developed its own ecosystems and native flora and fauna abound, both in the waters and on the many islands. Boat cruises on the lake are the best way to experience the magnificent scenery and wildlife of the area. The massive manmade Lake Argyle is situated in the east of the Kimberley, near to the Northern Territory border, and is a popular stop-off point en route to Darwin or Broome. It also makes for an interesting daytrip from nearby Kununurra and is especially hailed for its fish and bird populations. This important wetland was created in the 1970s through the curtailing of the Ord River. An earthen dam 335m in length and almost 100m high was built to create the most voluminous artificial lake in the country. It covers an area of approximately 1,000 square kilometres at normal capacity, rising to double that during high wet season levels. The Ord Dam is quite unremarkable as far as dams go as it is diminutive in relation to the surface area of Argyle Lake. It resides at the northern end near the resort and charming picnic area. The rocky spillway is a natural feature of the lake and is located remotely from the dam itself at ‘Spillway Creek’ at the head of Pannikin Bay. It then drains back into the Ord before hitting the Timor Sea farther north. Of the main native species of fish here are the long tom, barramundi and fork-tail cat fish and there are literally thousands of freshwater crocodiles. Over 150,000 water birds occupy the grasslands and mudflats about Argyle Lake, with magpie geese, pacific black ducks, Australian bustards and long-toed stints here in large numbers. Activities include boating, kayaking, swimming or admiring the museum. The top place to stay is Lake Argyle Resort, a pretty complex with an infinity pool that looks out over the lake’s north shore. There are plenty more hotels and camping spots in Kununurra, which is less than an hour away via the Victoria Highway and Argyle Road. Broome is over 1,100kms away. Lake Argyle is located 70 kilometres from Kununurra in Western Australia’s Kimberley region. Lake Argyle offers a greater expanse of water from which steep red rocky slopes reach up in awe-inspiring grandeur.